The fertilization process and embryo mortality during incubation. What is the Relationship? 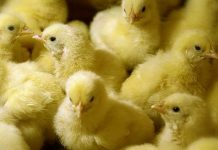 Home Poultry Facts Hatchery Practice The fertilization process and embryo mortality during incubation. What is the Relationship? 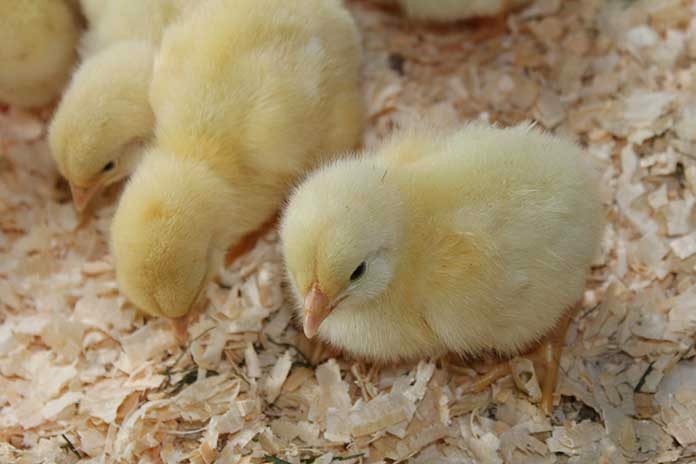 The goal of a successful incubation operation is to produce the maximum number of quality chicks from the fewest breeders housed in order to meet the company’s market demands. In an ideal world, this could easily be attained by consistently having: excellent growers and personnel, top-notch breeding stock, outstanding fertility, and exceptional facilities (hatchery and breeder housing), all resulting in superior hatchability and chick quality. Further complicating this process is that this must also be achieved in the most economical manner possible. Unfortunately, we do not live in this ideal world so these criteria are not easily attainable. Furthermore, we are dealing with a biological system where 100% success is physiologically impossible. 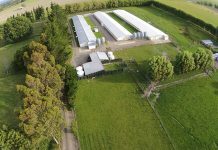 Breeder flock age, health, strain, nutrition and management are critical factors which influence hatchability and chick quality through their effects on fertility and egg shell quality. Additionally, hatching egg handling after the eggs are laid also plays a critical role in their potential hatchability and the subsequent chick quality. Once the egg is laid (oviposition), its hatching potential is already determined based upon the previously mentioned factors of the breeder flock. This hatching potential can, at best, be maintained through proper pre-incubation egg handling as well as the incubation process, but their potential cannot be improved at any time in this process. The modern day broiler breeder hen often requires very specific management and nutrition both prior to and after the onset of reproduction to achieve their full reproductive potential. These needs must be adhered to in order to maximize the number of quality chicks placed in a broiler house. With the increased difficulties in producing enough viable fertile eggs, proper egg handling and incubation practices must be followed. Events that occur after oviposition, and both prior to and during the incubation process, can cause costly reductions in hatchability from eggs from an otherwise healthy, fertile and productive flock. A review of the process of fertilization and embryonic development will help to understand the importance of proper egg handling and storage conditions in which hatching eggs are often subjected. Approximately 20 minutes after oviposition, the next ovum (or yolk) is ovulated and this is the egg that is generally laid the following day. The recently ovulated ovum must be fertilized within the first 5 minutes following ovulation. If the ovum is not fertilized within this short period of time, fertilization cannot occur as the egg albumen is immediately deposited to surround the entire yolk, and contains an enzyme inhibitor that prohibits fertilization from occurring. 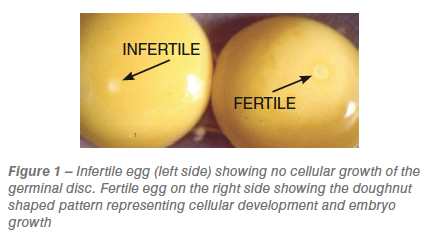 With the egg albumen present, sperm cannot penetrate the perivitelline membrane surrounding the yolk and cannot gain access to the female genetic material in the blastodisc of the ovum. As the yolk, or ovum, moves down the reproductive tract, additional egg albumen is deposited around the yolk followed by the formation of the eggshell membranes around the albumen. The egg-shell itself is then formed and deposited on the membranes to surround the entire contents of the egg. This entire egg formation process requires approximately 24 – 26 hours to complete. While the egg progresses down the reproductive tract, it is maintained at the hens body temperature of between 104° and 106° F (40° and 41.1° C). Physiological zero is considered to be the temperature at which significant embryo development will occur and has been determined to be greater than 75° F (23.9° C). Obviously, the hen’s body temperature is sufficient to allow for embryonic development to take place during the 24 – 26 hours after fertilization while egg formation occurs, prior to oviposition. 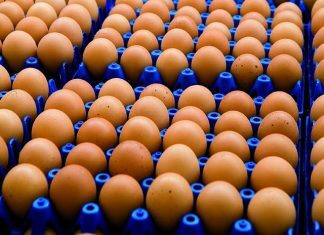 Due to the body temperature of the hen and the time required to form a complete egg, the chicken embryo is viable and growing; composed of approximately 20,000 – 40,000 cells at the time of lay. This early cellular development of the embryo, which occurs in the oviduct can often be seen with the naked eye in a freshly laid egg (Figure 1). Essentially then, it requires approximately 22 days from the time of fertilization to hatching to complete development with about 4.5% of this development occurring prior to oviposition. Many people consider hatching eggs as eggs that are fertilized but have not yet started developing. However, fertilized hatching eggs do contain live and viable embryos, therefore, how they are cared for from the point of lay to the start of artificial incubation is ultimately critical to the success of that embryo. Embryo mortality is a normal occurrence throughout the life of a flock because embryo development is a biological system where nothing is perfect. When dealing with ‘biology’ and ‘nature’ the terms ‘Never’ and ‘Always’ should not be used as failures do and will occur. It can be said to “never say never” and “never say always” when discussing a biological system or event because nothing is exact. However, there are trends and occurrences that happen frequently enough that there are expectations that should be planned for and considered. In the case of overall embryo mortality, it is expected to experience 4-5% total embryo mortality during the incubation period. There are developmental challenges that occur in the first few days of embryo development (differentiation, begins days 2-3) and in the latter stages of incubation (pipping and onset of pulmonary respiration, days 18-19). When cellular differentiation or the embryo switching to pulmonary respiration fails, embryo mortality will occur. While there are certainly other stages during the incubation process where mortality can occur, these areas are expected as a result of the imperfections of the biological process of the developing embryo (Figure 2). While achieving this ~4-5% total embryo loss should be the goal, it is unlikely that, even under the very best conditions, a producer can routinely expect mortality significantly less than these values. However, with improper management these values are often elevated. 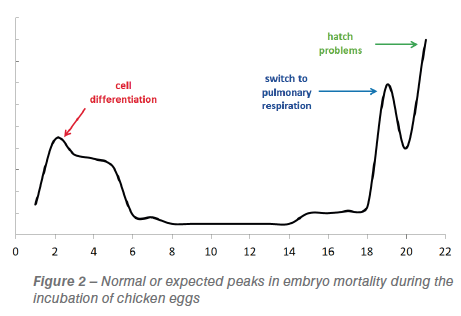 Other than the expected mortality levels due to failures in embryo development, elevated early embryo mortality is usually associated with improper hatching egg handing practices prior to incubation such as: frequency of egg gathering, duration or length of storage, storage temperature abuse, transportation, etc. Elevated late mortality is usually due to inconsistencies in the incubation practices, but can also be elevated by other breeder management factors similar to egg storage abuse. While elevated early embryo mortality is usually associated with improper egg handling practices, there is another factor that can cause high embryo mortality, and that is poor fertility due to infrequent mating. Hens in nearly all avian species have the ability to store sperm cells in an effort to increase the likelihood of successful fertilization. In active laying hens, the biology of the hen and the mechanisms of egg formation result in an oviduct that is occupied for all but 20-30 minutes each day. As previously discussed, 20 minutes after laying an egg, the hen will ovulate another ovum, and this yolk will be the one contained in the next day’s egg. Because fertilization must occur immediately after ovulation, the hen must have sperms cells stored and ready for fertilization, which can only be accomplished by storing sperm cells in vivo. 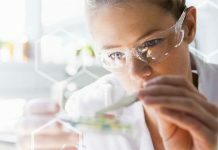 Although the hen has the ability to store sperm for up to three weeks after a single mating or insemination, the sperm cells do not contain the same potential the longer they are stored in the hen. Figure 3 depicts the reduction in fertility for each day following an insemination dose of 100-200 million sperm in broiler breeder hens. During natural mating, it has been determined that a male will deposit between 100-200 million sperm, so this data is representative of what would occur following the natural mating process. 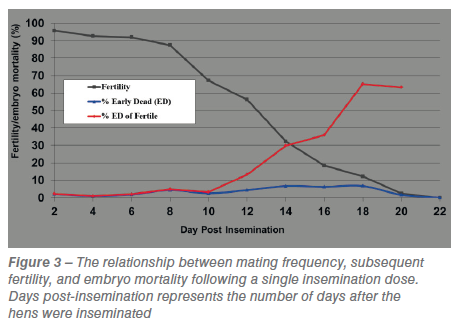 As can be seen in Figure 3, after eight days, fertility begins to drastically drop with each successive day until fertility is ceased by 22 days post insemination. All eggs were stored and treated equally with no other contributing factors such as egg storage temperature, storage duration or flock age. What is interesting is the fact that after 10 days post insemination, the percentage of early embryo mortality of the eggs that were fertile begins to increase and continues to do so until the cessation of fertility by day 22. So in situations of infrequent mating, the hen will have to rely on the sperm cells she has stored from the most recent mating or insemination. The longer the sperm cells are stored in the hen, the less viable they become, resulting in a developing embryo that has lost some vitality and vigor and has an increased likelihood of dying in the first few days of incubation. Infrequent mating is a common situation to encounter in older breeder flocks. Older hens are physiologically less fertile, and older males are often less active and therefore mate hens less frequently. These conditions result in a correlation, particularly in older flocks, between reduced fertility and increased early embryo mortality. This is another one of the factors that can cause elevated embryo mortality that is independent of an incubation program but definitely part of a hatchery/breeder program. While a basic understanding of the developmental physiology of hatching eggs and embryos is important, management factors are most critical. A successful hatchery/breeder program requires an understanding of all areas of the hatchery-breeder program, from the breeder house, to egg handling and incubation, to chick processing and everything in between. Cooperation between personnel and management programs is necessary between all parties to ensure each egg has the maximum hatching potential as they leave the breeder house and arrive at the hatchery. While the ultimate goal of a poultry operation is the production of animal protein in the form of meat, the entire production system is linked together. Conditions that lower fertility, subsequent embryo morality and then reduce hatch, will also affect broiler performance. Each area of reproduction is correlated with each other and plays a role in the success of the following areas of the production system. The production of hatching eggs and properly caring for them throughout the hatchery/breeder management program will result in the increased number of chicks’ produced, as well as an improvement in chick quality and performance.